The first time we played this, Mrs Meeple was seriously convinced I was going to throw the damn game out the window. She thought this because I had said, seriously, ‘I am going to throw this damn game out of the window’. That’s not a reflection on the quality of the game experience, but rather on the quality of the components. 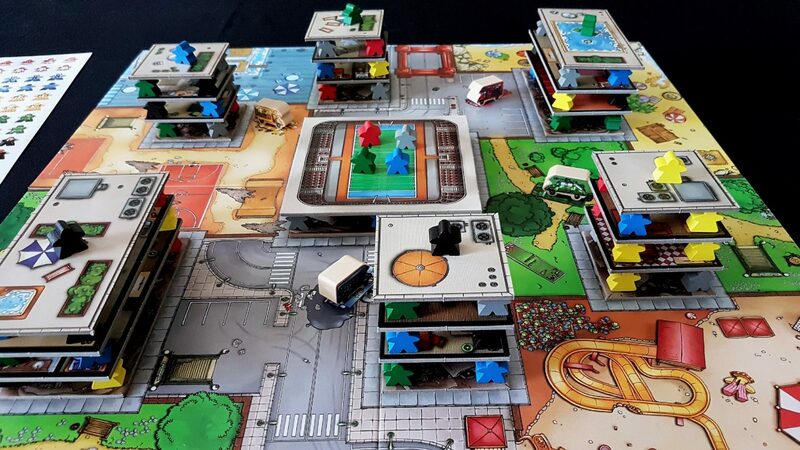 The board of Terror in Meeple City has to be part assembled by you, the unfortunate player. That involves removing paper backing from some cardboard blocks and affixing then permanently to the board by their newly exposed sticky surfaces. 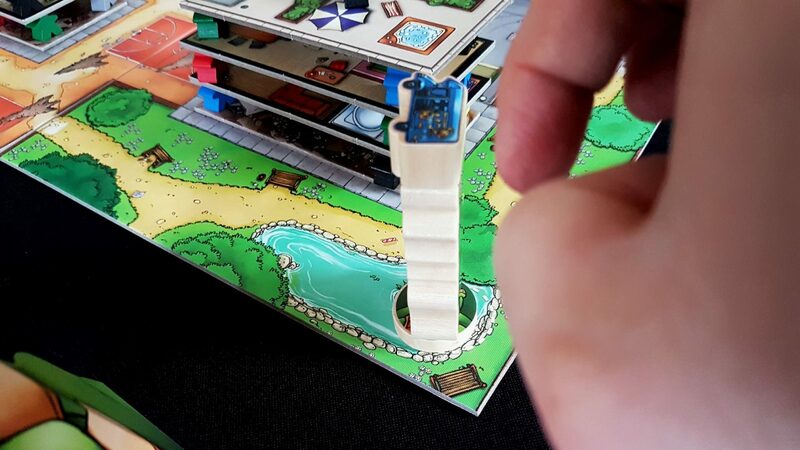 The problem is that the glue on the back of these is piss-thin and won’t actually hold a seal – every time you move the board you end up scattering every one of the supposed permanent fixtures. Don’t let anyone tell you any differently – you’re going to need some glue if you want to play this. Glue the damn bits to the board, don’t even pretend that they have a sticky back. Otherwise you’ll just end up frustrated and throwing a heavy box of cardboard at the startled cat in the back garden. And let’s be honest – that cat did nothing to deserve your wrath. I feel better for having gotten that off my chest. As to the game itself – well. 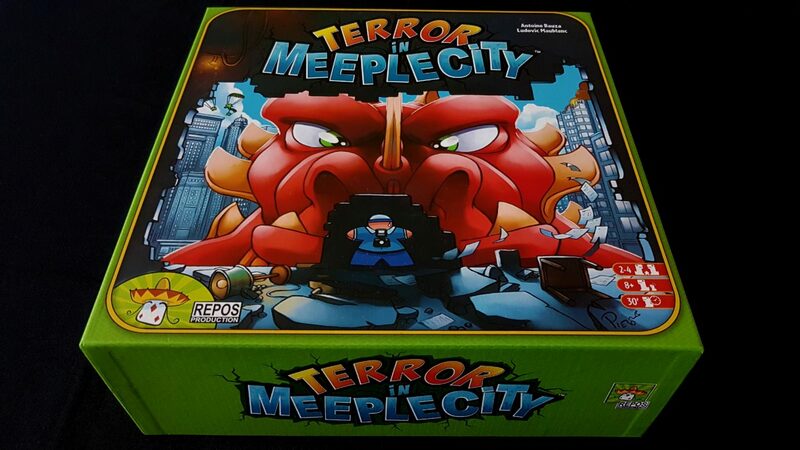 Imagine Cube Quest and King of Tokyo had a baby and you’re 95% of the way to understanding how Terror in Meeple City works. Throw in a bit of Rhino Hero and you’ve got all the DNA paternity data for a thrilling episode of the Jerry Springer show. Twist ending – they’re all the dad! Here’s how it works. 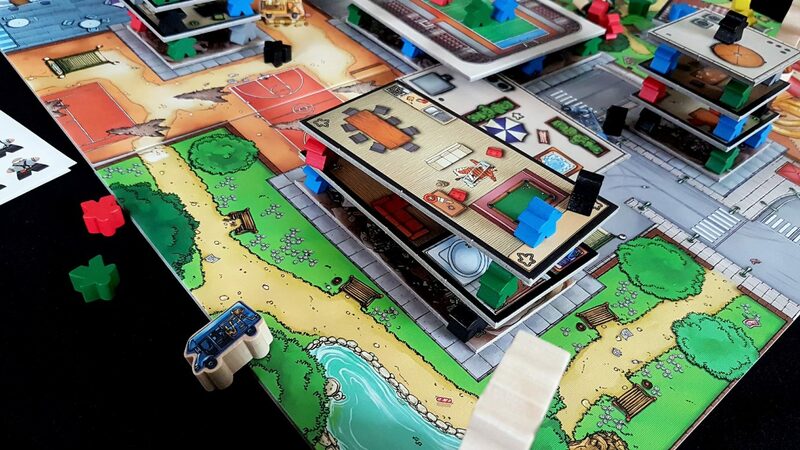 You and your fellow players will spend five minutes constructing Meeple City from the components you have in front of you. You don’t get any flexibility in how the city is built – the street plan is defined well in advance. It’s like the world’s least creative Lego set. That is, I think, one of the great missed opportunities of the game. Once we’ve gotten them in place, their cheap fallible flesh taking the role of more expensive concrete, then we place a roof over their heads. Each of the cards are double-sided to permit them to be used as interior floors and exterior roofs. Who counts the money underneath the bar? And then you build a third, capping the structure off with a top level roof and a single meeple standing atop surveying the pristine lands of the soon to be devastated city. Once you’ve done that, you do it for all the other buildings. What you end up with is striking – a brightly coloured playground for the epic rampage about to unfold. It looks like a lot of relatively intricate setup, but once you get into the swing of it it’s only a few minutes of work if everyone pitches in. It’s a chore, no doubt about that, but it’s also part of what makes the ensuing chaos so viscerally pleasurable. There’s joy to be had in building something up, but also joy to be found in tearing stuff down. 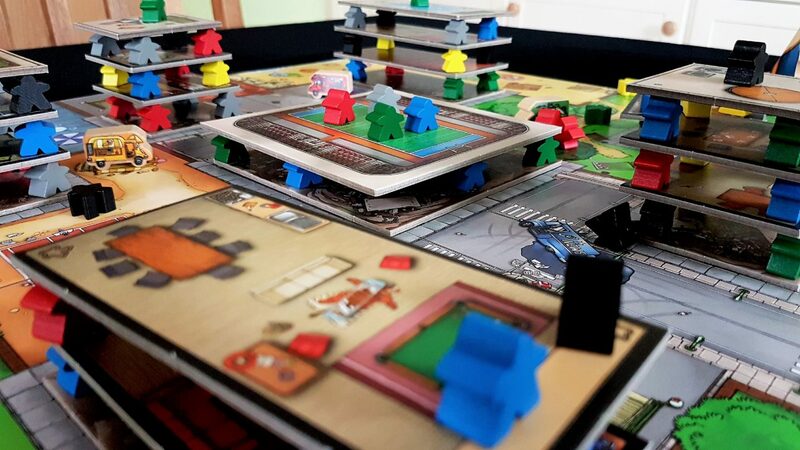 Terror in Meeple City has you covered on the forward and backward legs of the entropy curve. I would have liked to see more options given for players to build a city of their own though – while that’s technically possible, there aren’t really enough components to permit anyone to get creative. A bit more modularity in this setup would have added a vital dose of longevity to the game at virtually no real cost. Once the city is constructed, the monsters make an appearance. 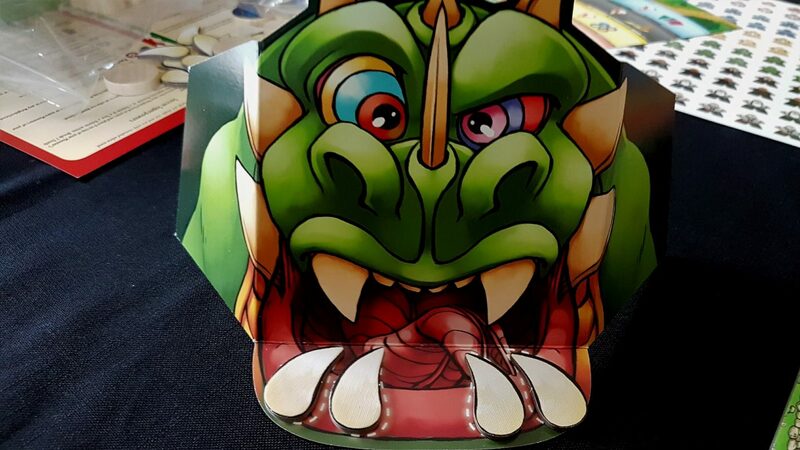 Each player gets a monster screen that shows how many teeth they have available – this is a measure of health, but also a means of tracking the degree of furious mastication permitted in the prosecution of their monsterly duties. The screen otherwise serves only to obscure the contents of our stomach so as to keep the state of victory obscured until the last phase of play. The monsters themselves consist of two parts – a heavy, weighty block of wood representing the leviathan bulk of the Kaiju Kreature and a smaller disc that represents its paws. Each turn you can perform two of four actions. The first of these is to flick the paws to move your creature around. 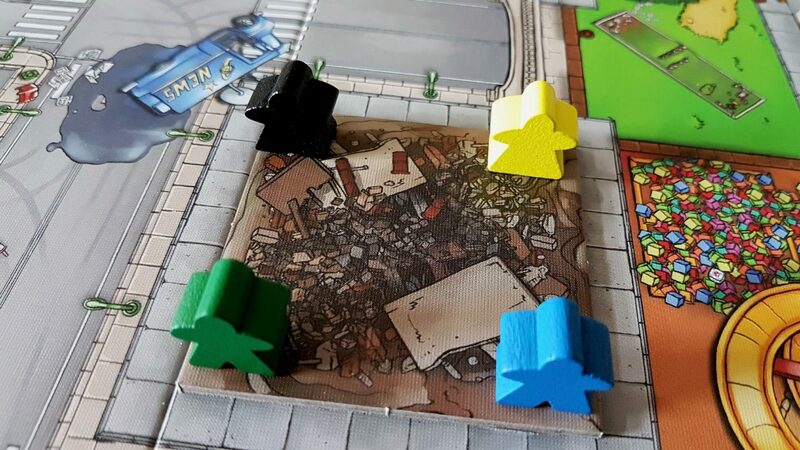 This is your primary form of locomotion – you need to be next to buildings to smash them up, and within the coloured regions to eat the meeple that fall into your path. You get where you want to go by applying precise pressure to paws. However, as you might imagine this is very difficult to do properly. The raised foundations create a barrier you will often bounce off, and in order to smash a building you need to get your disc onto the laughably precise dimensions of the surrounding sidewalk. The end result of these two competing forces is that you’ll often flick a little too hard and bounce away from the action, or misjudge the force and your disc will rest limply a few inches from the target. Either of these is annoying for you, but comical for everyone watching. 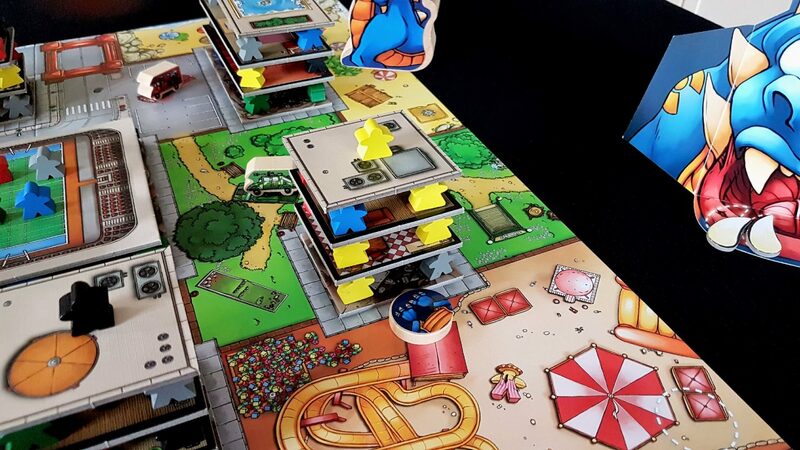 Terror in Meeple City is a game of unforced errors leading to moments of considerable levity. At least, that’s often the case. Some of us are just natural flickers. I’ve got magic fingers you see – it’s why every time I use them I generate intense satisfaction. And then releasing it onto the building at a point of your choosing. When roofs go flying, you get to eat them – they’re full of fortifying concrete and iron and meet 25% of your daily recommended caloric intake. As long as the roof is supporting nothing, it goes in your belly. Get in my belly, roof! Once your two moves are done, you can chow down – you can eat any unprotected meeple that landed in your current region, up to a number indicated by the teeth you have available. These, like the roofs, go into your belly. Everything goes in your belly, because you’re a hungry beast and the city is so delicious. 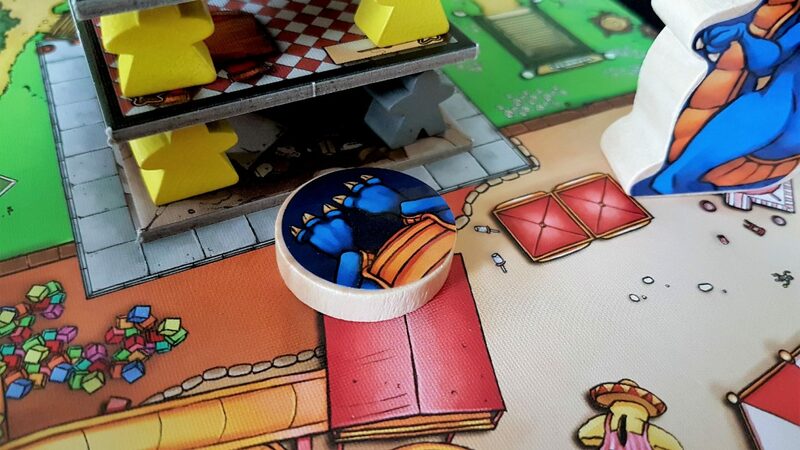 You’re going to chew through everything in Meeple City like Homer visiting the Land of Chocolate. Every monster has the same four basic sets of things they can do, but we also configure each beast with three cards. You have a character that influences how scoring is conducted, a power that provides a special unique bonus, and a one-use super power that we hold secretly until we want to use it. Our character and power is public knowledge. Our secret power is… well, a secret power. Our green monster has the power of Telekenisis which allows us to throw vehicles even if they’re not in the current region. This monster is also a punk, and will gain two bonus points for each pair of grey and black meeple that end up slowly digesting in the cavernous interior of our stomach. In the context of the game, grey meeple are the elderly and black meeple are businessmen. Fight the power! Oink, oink pigs! Oink, oink! Hope I die before I get old, and so on, and so forth. 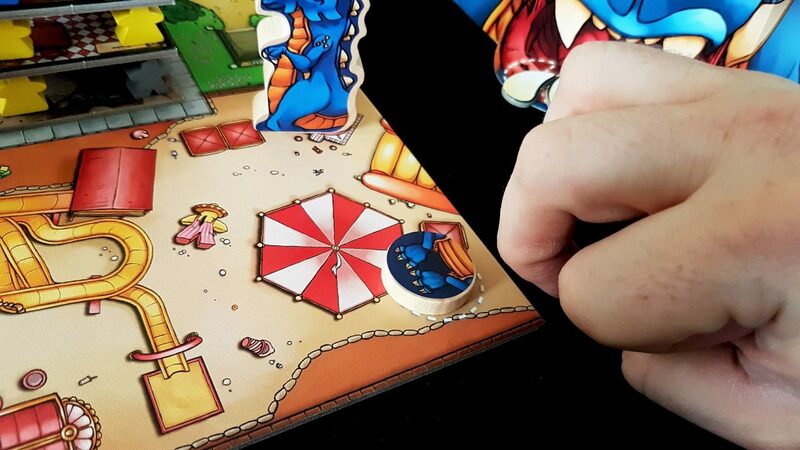 Blue on the other hand is a pacifist with sharp canines – blue can eat two more meeple than the number of teeth would imply, and gains a bonus ten points at the end-game scoring if there are more green meeple (soldiers) in their stomach than anyone else’s. This, one might reasonably suggest, is an odd definition of ‘pacifist’. Once blue has finished with the surgical application of controlled chaos, green gets to do some damage. We’ve seen two moves that a monster has available, but green is going to show us the others. The first is that any monster can throw a vehicle if there’s one in our current sector. Green though is telekinetic and doesn’t need to worry about that spatial limitation. Green picks up the blue vehicle from an adjacent region, ready to throw it. 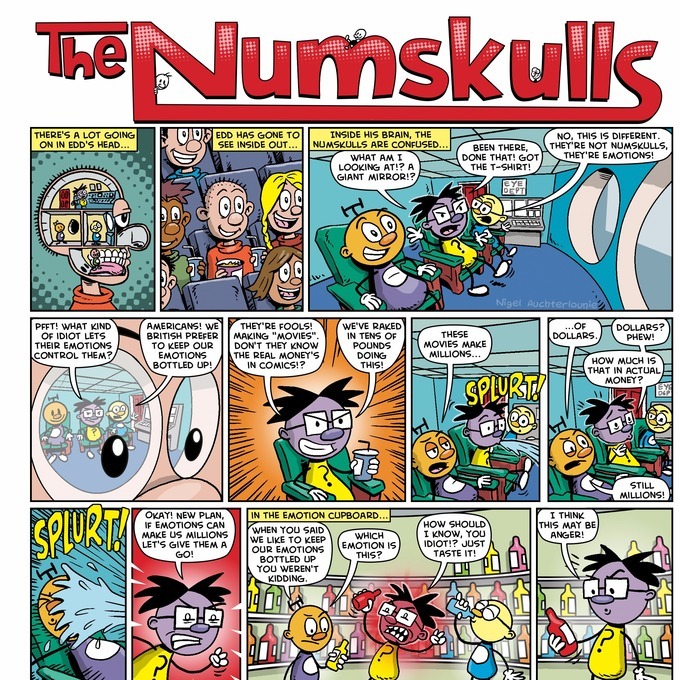 You, as the numskull operating the monster from its minuscule hind brain, do that by positioning the vehicle on the head of the monster and… well, yes. You throw by flicking the vehicle at something elsewhere in the city. If you knock over another monster, you get to steal one of their teeth and eat it – that’ll get you some points at the end. Otherwise you’re just looking to make your mark on the city in which you’ve found yourself. The vehicles are satisfyingly heavy and can do real damage when they hit the right target. That, again, takes a fair degree of skill. 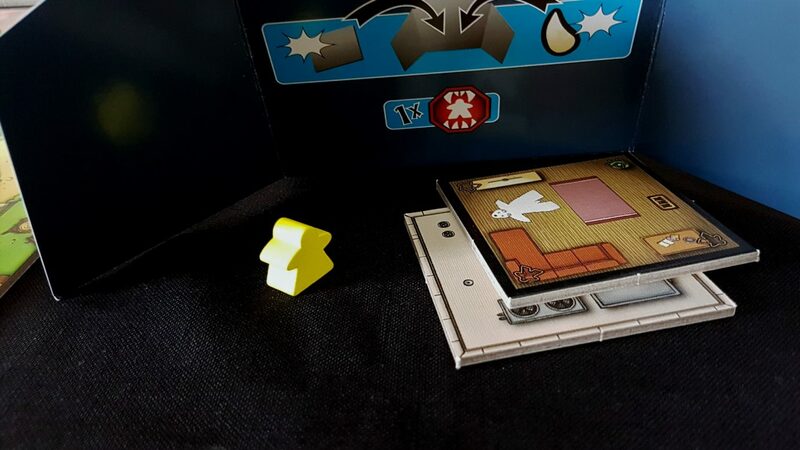 Despite being only supported by a few meeple, the buildings can be surprisingly resistant to forces acting upon them – especially forces that press down from above. You might well flick a vehicle to find it resting comfortably on a rooftop. The only effect you accomplish in such a scenario is to frighten the poor soul that was watching the excitement from an assumed position of safety. Also, I suspect the driver of the vehicle might not be entirely unshaken by their rapid acceleration to the roof of a remote building. The fourth action you have available is a breath attack, and this works by you placing your head on the top of your monster and blowing as hard, or as soft, as you like. 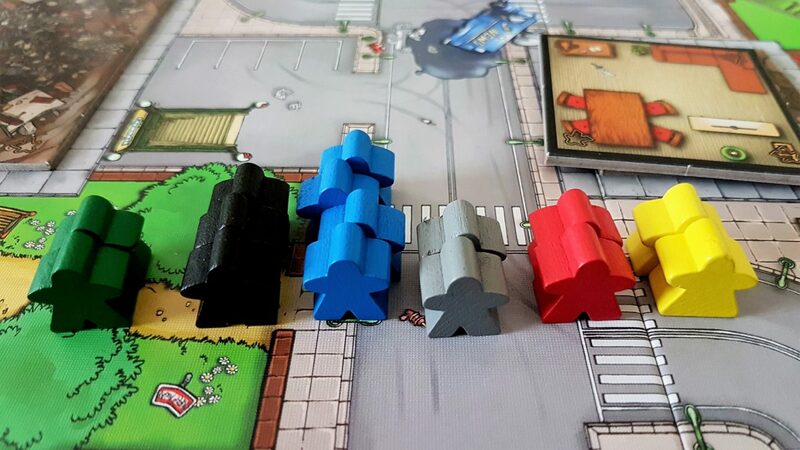 As a way of sending meeple flying from the safety of the buildings into the dangerous streets outside it’s hard to beat. If you’ve got a good pair of lungs on you though the devastation can be significant. It can be very satisfying to take a deep breath as you place your head down and just send a dozen people tumbling away from you. It’s like having chronic halitosis that operates on a macro cityscale. 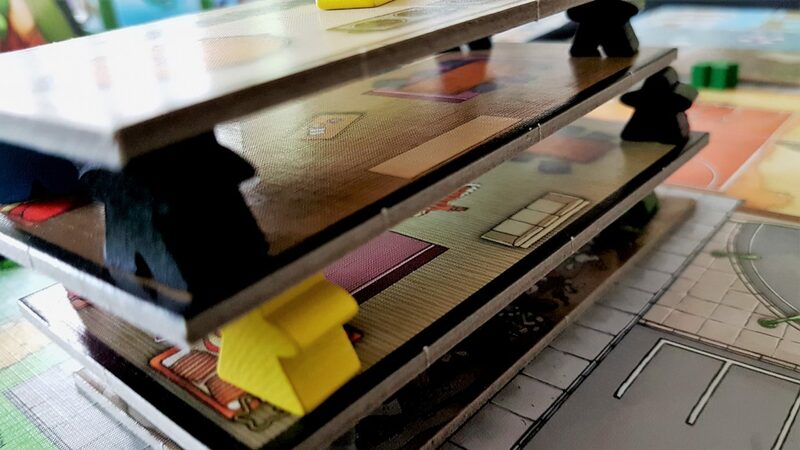 The problem with all of these attacks though is that they come with a risk – they often send meeple off the side of the board, and we don’t want that to happen. Whenever meeple leave the board they count as ‘runaways’. Depending on which game mode we’re playing, when we trigger a fail state on the runaway tracker something bad will happen to us as a consequence for our indifference to those fleeing in terror. 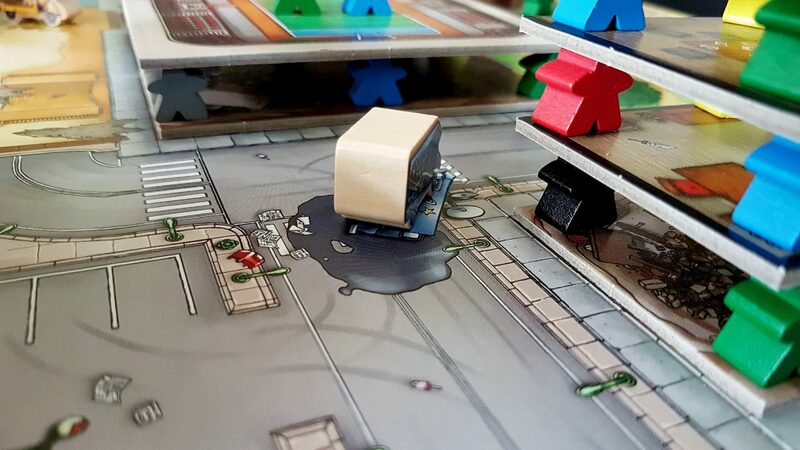 And so it continues, each player in turn taking their two actions to rip a new hole in this unfortunate cardboard city, leveraging the power of gravity to scatter meeple and roofs everywhere. The more damage you cause, the more roofs you eat, and the more meeple make their way into your stomach. If you’re good at this kind of thing, you may find yourself unable to stuff even a wafer-thin mint into your mouth by the end of play. If you’re not so good you’ll find yourself the star of some intensely comical moments. You might see yourself flicking a vehicle at a building only to have it skid merrily through the bottom floor with no real damage. The end result of an attack might just be to slightly weaken the foundation of a faraway building. 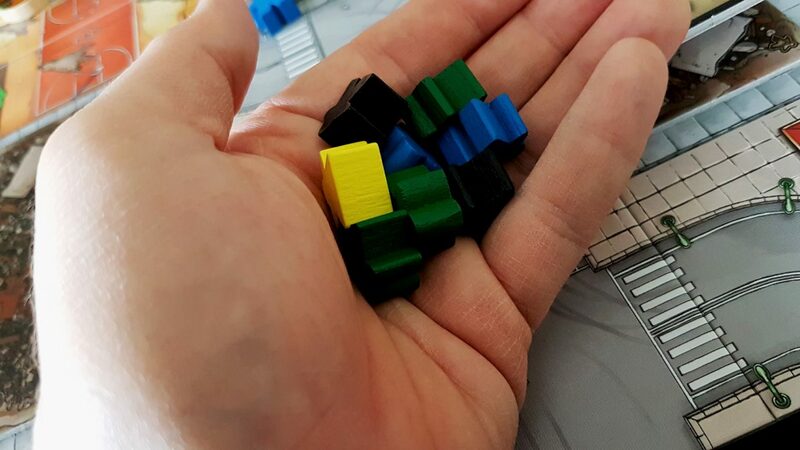 In rare circumstances you may simply find that you blow delicious meeples into the foundations of a building and find them frantically propping up the whole edifice like a kind of crowdsourced wooden Atlas. 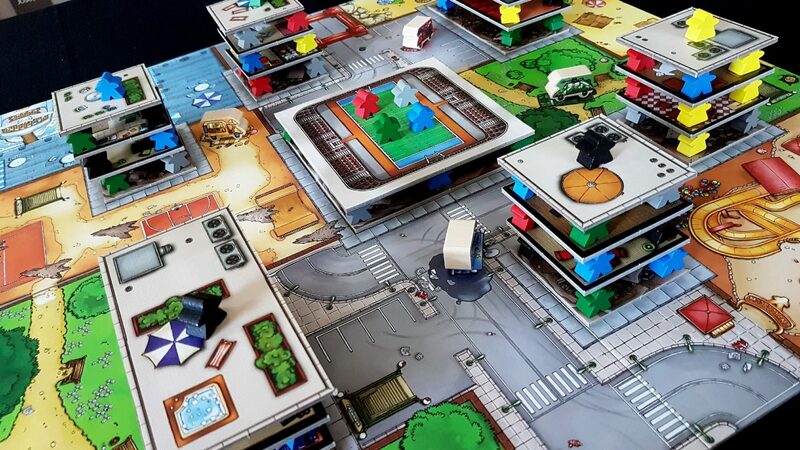 Effective attacks send meeple pouring into the street for you to consume with gusto. 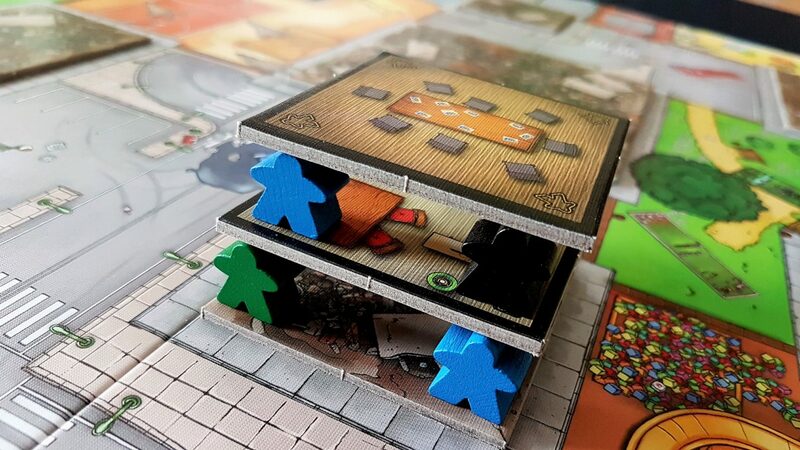 On good turns you’ll be hauling handfuls of meeple out of the city, turning a bustling metropolis into a virtual ghost town. Meeple City is a fashionable bistro, and you’re guaranteed a reservation any time you feel peckish. On poor turns all you’ll do is knock potential victims onto the sidewalks and away from your teeth, or send them gleefully out of the city to add another notch to the runaway counter. The penalties associated with filling up one of these tracks are unfortunate – you lose a tooth, but usually everyone else gets to do something as a bonus. As a penalty for you filling up the first track of runaways, another player might get to move an enemy monster into a region of their choosing. Usually one without access to much in the way of delicious treats. Look at all that death shown in the image above – all that casually chewed meat. It’s worth only ten points because there’s only one grey meeple in there. Everything else, unless it’s used for special scoring, is worthless. That means the winner isn’t necessarily the monster that worked the hardest to eat the most voraciously – it’s the one that succeeded most effectively in consuming a balanced diet. Terror in Meeple City is dietary propaganda as much as it is anything else. Eating twelve meeple can be far more valuable than eating fifty, provided you make the effort to vary your intake a little. This little quirk of scoring also creates a nice puzzle right from the very first initial tremors of the game. Let’s rewind this monster movie to the start before the creatures came. Look, Simba – look at everything the light touches. With the benefit of hindsight now we can see these buildings aren’t just ‘target rich environments’ – they’re scoring opportunities. Meeple are picked randomly to act as foundations – some buildings are going to be better than others. You can’t just eat randomly, you need to eat intelligently. You might want to take your time and work your way methodically through two adjacent buildings just because two of your friends are already fighting over the buildings with the greatest plurality of residents. 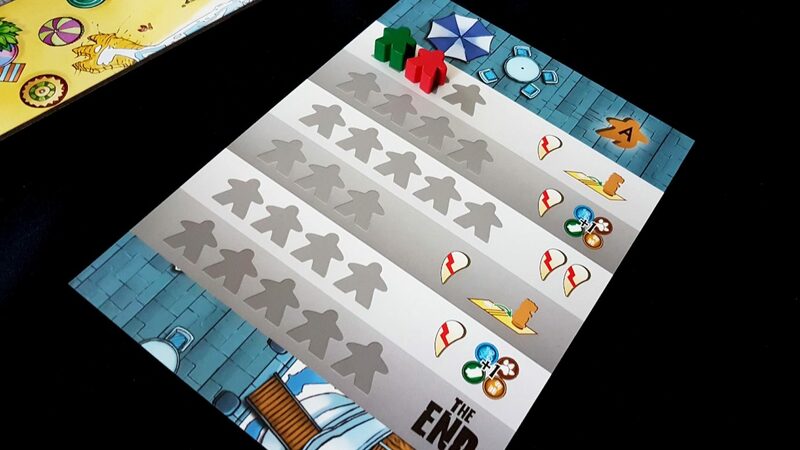 Terror in Meeple City presents you with a scenario in which the tragedy of the commons can play out over, and over, and over again. You get to choose how to respond to that. If you take it seriously, Terror in Meeple City can be an endless proving ground for the Nash Equilibrium. Don’t get me wrong – I’m not claiming in any way that this is a complex or especially strategic game. It is, in the end, a game of hurling bits of wood at bits of cardboard and enjoying the resultant mess. It’s just not quite as shallow an experience as the mechanics might imply. 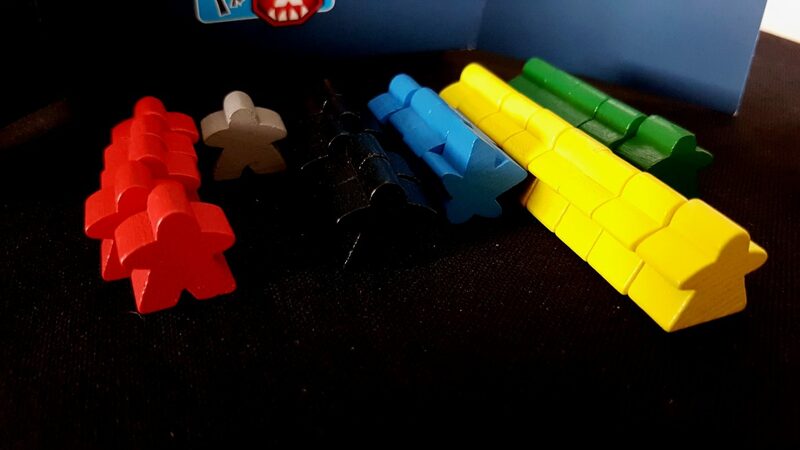 The value of meeples is adjusted by the character cards you pick up, and some of the special powers too offer interesting ways to change the flavour of the game. You might be given ‘stretchy paws’ which lets you position yourself in a region before you flick to move. You might be a ‘kung fu master’ which lets you flick your paws from the top of your head as if you were flinging a vehicle. 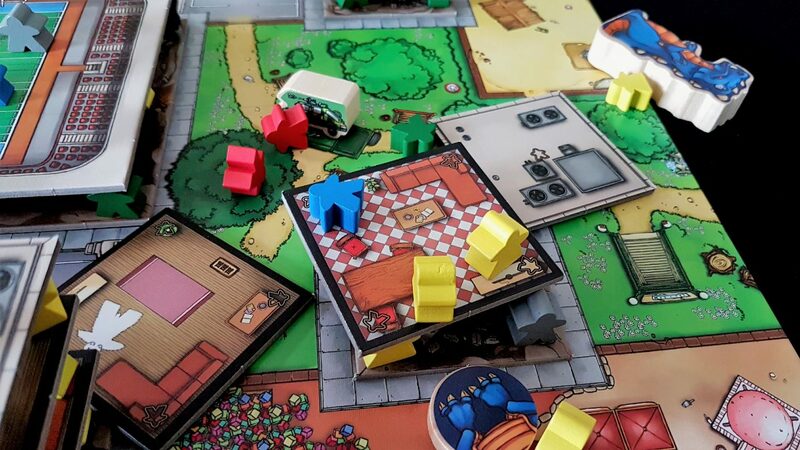 You might be able to climb onto rooftops, or eat meeple from adjacent neighbourhoods. 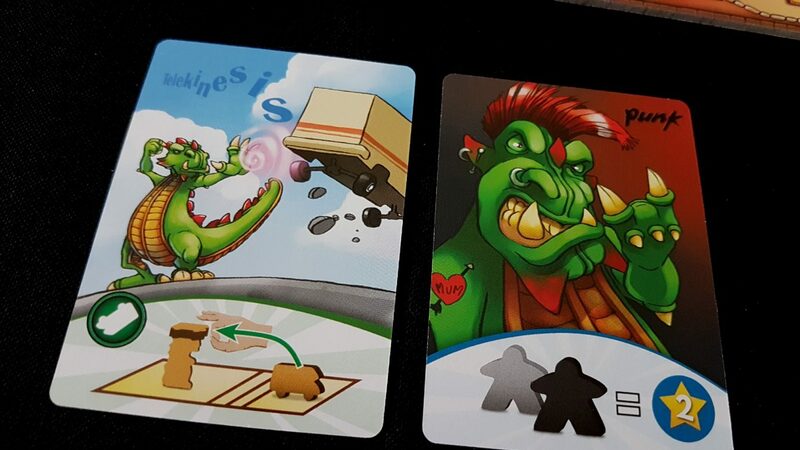 Your special superpowers also give you a chance to do spectacular things, such as eating the meeple from the runaway board or drawing three new power cards and make use of them for a turn. Again, none of this makes this a deep game but it certainly makes it a lot of fun. It’s an intensely likeable game, and while there might not be enough to it to keep adults coming back over the long term it’s almost certain to be a massive hit with kids. How’s it going in there? 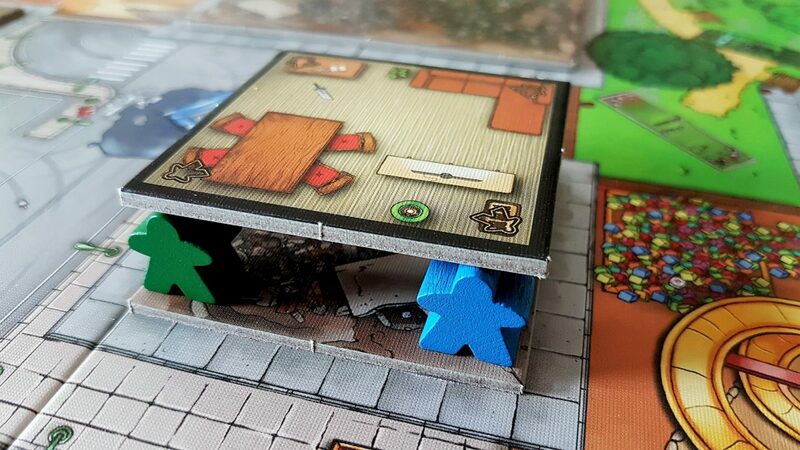 Terror in Meeple City creates abundant opportunities for genuinely hilarious situations. It’s funny to see the perfectly aimed vehicle toss that does nothing except come to a gentle halt on the sidewalk in front of the target. It’s comical to see someone flick their monster into a region full of delicious meeple, only for the motion of the disc to send each of those meatbags scurrying away to safety. Attempting to blow a building full of meeple on to the ground only to send them flying into the cheerful mouth of an opponent is amusing. Not as amusing though as blowing as hard as you can to accomplish only a gentle shudder of your target building. 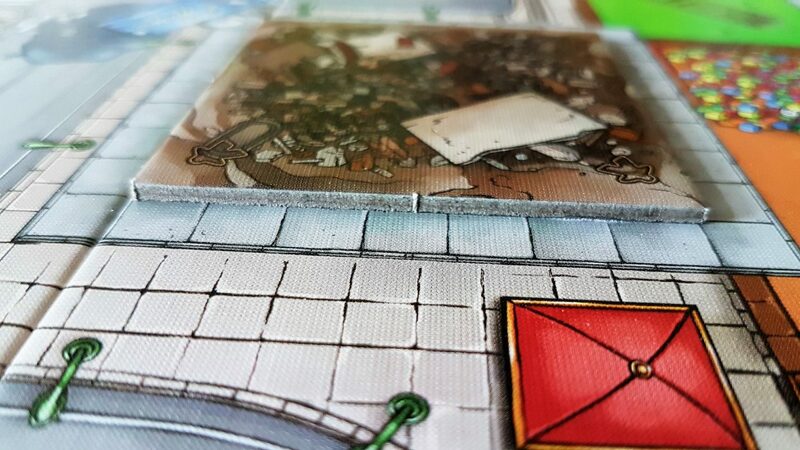 You might think you can deprive an opponent of a victory by dropping your monster onto a fragile building, only to have it bounce off the table. The physicality of play creates many opportunities for you to cheerfully embarrass yourself, and the entire tenor of the game makes that as much fun as success could ever be. 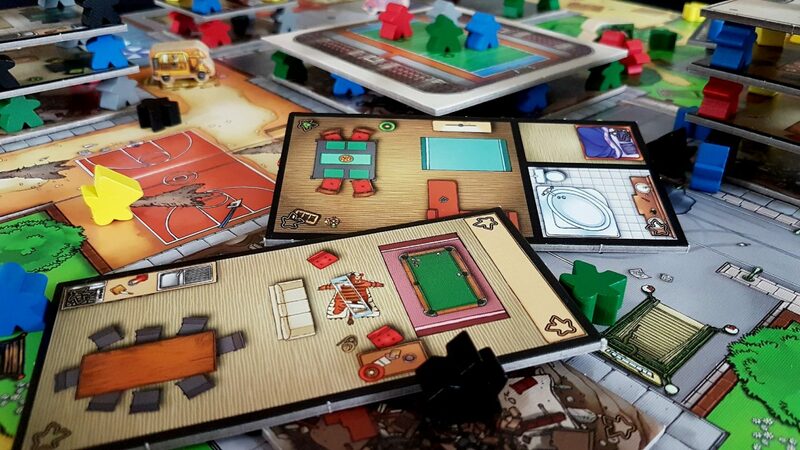 I wouldn’t recommend Terror in Meeple City unreservedly – it’s not the kind of thing you can lose yourself in mastering. Once you’ve played it a couple of times every subsequent game will feel very similar. However, I’d recommend it liberally and freely to anyone that wants a sure-fire crowd-pleaser they can break out for even the most jaded occasional audiences. It’s a game you can’t even explain without seeing an array of cynical scowls turn into delighted, excited grins. 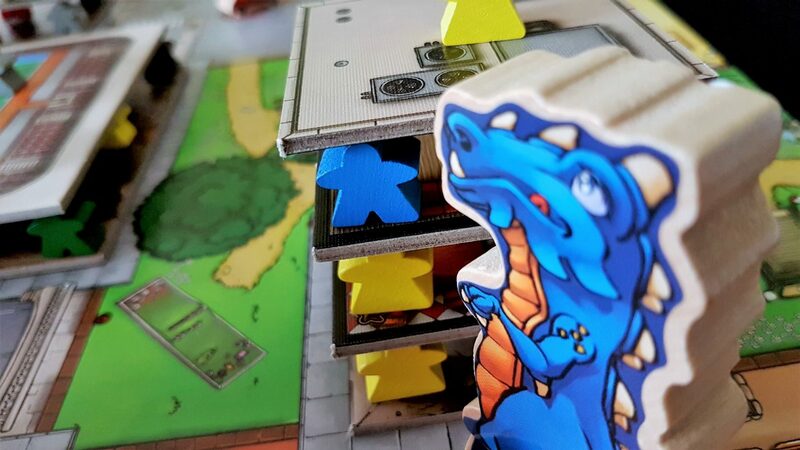 Terror in Meeple City brings out the hidden Godzilla in each of us, and it’s rare in life that anyone really gets an opportunity to fully enjoy their most destructive urges.